Difficult times. The last two weeks were hard for me scientifically. In addition to having two papers rejected within a week, I learned that a major grant proposal that was rejected. Particularly the latter I didn’t take well, since I was quite convinced that we would make the next round. Also, this was for a project where funding was more than necessary. We all know scientific disappointments in their various forms, and I thought that I would dedicate a post to this topic. Please follow me while I stumble through the internet, looking for the science of disappointment. Isn’t it ironic? Alanis Morisette’s song came to my mind when we boarded the Lufthansa flight to Philadelphia last week. We were assigned the seats D-F-G, which spells out the acronym for Deutsche Forschungsgemeinschaft (German Research Foundation), the grant body that had given our proposal for a German-Israeli-Palestinian 1.2 Mio Euro research grant the thumbs down one day earlier. There are always certain stages I go through when I learn that a grant is rejected, and some soul-searching is always part of this. Psychological hygiene is usually considered one of the benefits of keeping a diary. Therefore, I thought that I would use this post as my little pink unicorn diary to chronicle my feelings regarding scientific rejection. The ability to recover from disappointing events is in fact well-researched, and I thought that I would embark on a brief journey through what is known on resilience and positive psychology. Disappointment. Disappointment conceptually is a feeling of dissatisfaction that follows the failure of expectations to manifest. Therefore, the first condition of being disappointed is being involved or invested. And, at a first approximation, the higher our investment, the higher the disappointment. However, if we look at how we react in different disappointing situations, we might realize that additional factors are at play. This is certainly true for my own history of scientific disappointments. Looking back, I have a few disappointments in mind that were quite memorable to me. I wonder why I took some disappointments better than others. For example, during my doctoral thesis, one of the mouse models I generated was a transgenic mouse that was meant to express Connexin 26 driven by the Connexin 36 promotor. I had worked hard to convince my boss to generate this mouse model in order to probe a possible re-wiring of neuronal gap junction between neuron. It took one year – and the transgene failed to be expressed. I was disappointed, but I didn’t really mind. I was busy with other projects that were promising, and I even felt proud of my pragmatic “cut your losses and let’s move on” attitude. However, only one year later, I was not able to maintain the same attitude when struggling to amplify a gene using a simple PCR reaction. I felt that my entire career was at stake, which gave me several sleepless nights. The difference between both situations was the environment I was in. In the first situation, I was fully embedded in a functioning lab environment with several people who had experienced similar disappointments. In the second situation, I was by myself, fully responsible for my own project with few people to talk to. 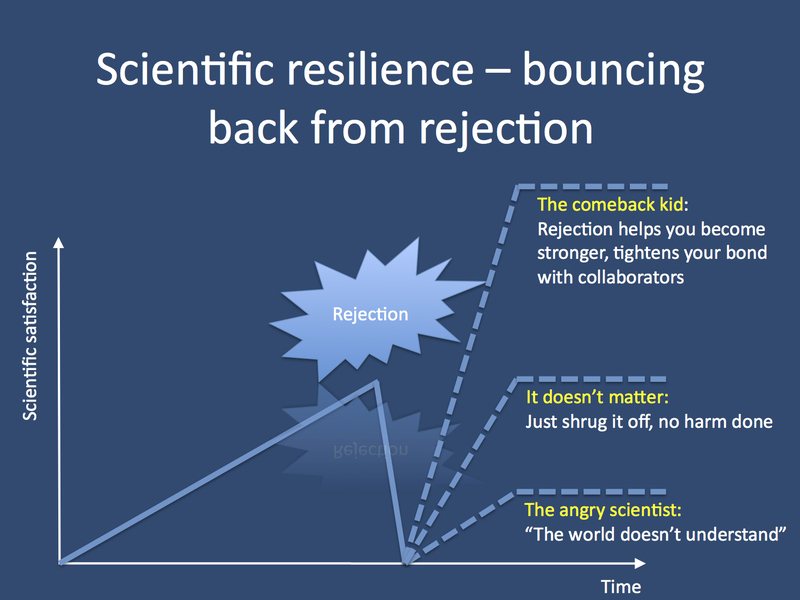 And this is probably one factor behind scientific resilience (the art of bouncing back after a disappointment): your research environment. The three scenarios after scientific disappointment. You either grow stronger (“The comeback kid”), things don’t change (“It doesn’t matter”) or you get depressed (“The angry scientist”). In order to better cope with scientific disappointment, we need to work on our resilience, mainly by actively building a supportive network and by focusing on fostering good and meaningful aspects of our work. The connected scientist. We have blogged several times about the necessity of networking and a nurturing research environment as a biomedical scientist in the 21st century. Particularly in the field that we are working in right now, there is little use in being an isolated genius. While this connection helps us advance as scientists, it also helps us when dealing with the impending sense of doom that sometimes accompanies rejections of papers, failures to obtain funding and seeing the finding that you have been working on for years being published by others. In fact, as with other “life events”, these situations can lead to different scenarios. They can (1) depress you in the long run, (2) can only harm you shortly with little difference long-term and (3) make you stronger. Besides the networking aspect, what are other factors that might help strengthen your resilience to scientific disappointment? It is tightly connected with what makes us happy as scientists. The pleasant, good and meaningful life. My journey through the internet eventually led me to positive psychology, a field of psychology that was largely influenced by the work of Martin Seligman. His concept of positive psychology and his data-driven understanding of human happiness are nicely presented in one of his TED talks. Basically, according to him, there are three different types of happiness that he calls the pleasant, good and meaningful life. And these concepts can also be translated to our situation in science. The pleasant life. The concept of a pleasant life relates to the pleasure you get out of enjoying a movie, good food, etc. It is about savoring. This part of happiness is hardly what we like about our work as scientists. Working on epilepsy genes rarely makes people laugh for joy or enjoy it like they enjoy eating ice cream. Besides, your personal set point for happiness appears to be fixed, probably with a large genetic impact, i.e. there is little that can be changed to help you enjoy things like successful experiments, accepted papers or funded grants better. However, as with other pleasures, the joy is short-lived and makes you ask for more. The good life. The concept of a good life refers to a life where your level of engagement in your work is ideally matched with your talents. Psychologists sometimes refer to the concept of flow, and this feeling is probably something that most scientists know. You get so engaged in your work that you don’t feel the hours passing. Flow and the concept of a good life is a different type of happiness that is more closely related to the satisfaction we get out of science. Flow while doing epilepsy genetics can be seen in people doing exciting lab work or programming for hours. Accordingly, one way to get people engaged is by providing them with environments where flow is possible. The meaningful life. The final kind of happiness, the concept of a meaningful life, refers to the satisfaction you get out of creating or generating something that benefits others and is larger than yourself. In science, this is not so much your actual publications, but the satisfaction you get from the good and free advice you gave to a colleague, the extra hours you spent with your students even though you didn’t have to, or the meeting that you helped organize. Life satisfaction as a scientist. There is much evidence from psychology research that life satisfaction is mainly dominated by satisfaction from the good and meaningful life, while the pleasant life barely adds to your overall satisfaction. Translated to science, our satisfaction with our work as scientists is not so much dominated by the short-term feeling of success after we have a paper accepted, but more by our ability to align our work with our talents to generate flow and the satisfaction from accomplishing larger things. This might sound contradictory, as we all want publications to be accepted and grants to be funded. However, this is the same as asking for ice cream and fast cars. It is temporary and boosts your happiness with little effect in the long run. To put it differently: you can be a very satisfied scientist without being a publication junkie or grant addict. Scientific resilience. Increasing our ability to withstand scientific disappointment is closely related to our strategies to be satisfied as scientists. If we over-emphasize the pleasure aspect (“happy to inform you that your publication is accepted”), you find yourself on shaky ground. Instead, the best way of preparing yourself for scientific disappointment is by building a support network and by focusing on the good and meaningful aspects of your work. Rage. One part of bouncing back from scientific disappointment is knowing yourself and allowing yourself to be angry temporarily. Don’t stay angry because you don’t want to be the bitter scientist who is mad at the world for failing to understand your genius. But enjoy being mad for the moment. Particularly in the last year, I have learned to enjoy this brief stage of anger and eventually even found my soundtrack for this. My ultimate survival song is “If I Survive” by Hybrid. I always feel better after listening this song, and I can get back to working “in the flow” with a renewed sense that this disappointment has made me stronger. If this doesn’t help, I re-read some parts of Paulo Coelho’s The Alchemist. How careful it was planned to do away with me. So kill me if you can, but words won’t make me bleed. But what if I survive, and live to tell the truth? Imagine my surprise to find me living and so very much alive. I’ll find a new life and hide, if I survive. But I swear you’re going down if I survive. This entry was posted in 2012, EuroEPINOMICS, Motivation, Opinion and tagged deutsche forschungsgemeinschaft, disappointment, Generation Y, grant proposal, human motivation, Hybrid, Martin Seligman, Paulo Coelho, positive psychology, rejection, resilience, The Alchemist. Bookmark the permalink.